I saw 19.9 knots on my handheld GPS, and I know we went faster than that, but at the time I wasn’t paying close attention to any GPS readout. The breeze was gusting into the 20s, and we were joking about whether or not the Marina del Rey harbor police would nail us for speeding. I saw 19.9 knots on my handheld GPS, and I know we went faster than that, but at the time I wasn’t paying close attention to any GPS readout. The breeze was gusting into the 20s, and we were joking about whether or not the Marina del Rey harbor police would nail us for speeding. On a different day, maybe they would have, but we had an expanse of protected flat water all to ourselves to play with Mike Leneman’s Multi 23, a nifty little speedster with thoroughbred genes, and play we did. Coming from the design board of the French firm Van Peteghem Lauriot Prévost—it’s not only acceptable, but cool to call them VPLP—the Multi 23 is wrapped in high expectations. VPLP is a leading designer of ocean-going trimarans, and they are celebrated for their work on USA-17, the giant tri that won the America’s Cup in 2010. In this case they’ve created an open boat aimed at sailors with a go-fast mentality. I picture this as a boat for racers, including those with a taste for boat camping. A dedicated cockpit tent is optional, and the boat’s cockpit lockers, plus a 9ft dry locker forward of the mast, can accommodate sails and then some. 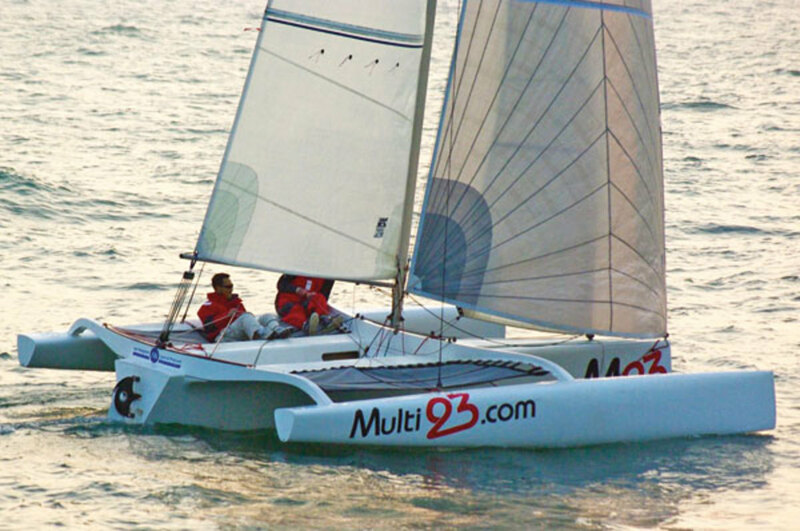 The Multi 23 weighs just 700 pounds and features very full, buoyant amas. You can press with confidence, as the boat does not want to dive and stick. The center hull has a fine entry and flat run aft for a slick exit. I felt clumsy with the long double hiking sticks and the twin-rudder setup, but that was about me. I’d welcome getting more time in the boat to get used to it. The helm was light and quick. The boat tracked easily through tacks, and the self-tacking jib minimized the “work” load. Gybing involved no drama at all. The standard auxiliary is an inboard-mounted electric motor, but Leneman, who imports the Multi 23 to North America, uses an outboard to achieve the 15 miles of motoring range required by local racing authorities. The boat is trailerable, but it takes about an hour to launch and an hour to retrieve. Leneman stores his boat in a lift-dock wide enough to accommodate its 15ft beam. The centerboard and rudders pivot, so yes, the boat is beachable, but this isn’t really an off-the-beach toy. Carbon-reinforced crossbeams and carefully engineered attachments contribute to a stiff structure. The hulls are constructed of infused vinylester resin, with solid glass below the waterline and Corecell foam on the topside sections and deck. The boats are built in Qingdao, China, and the fit and finish are convincing. Both rig options feature a rotating aluminum wing mast. The “cruiser” version has a reefable Dacron main and jib. I sailed with the high-aspect square-head main. Add Leneman’s custom, larger-than-stock jib mounted on a custom bowsprit—in honor of the usually light conditions in the region—and we had all the power we could use. Given more runway and a steadier breeze, boat and crew could have handled a spinnaker or screacher and it would have been, literally, a blast.